With advances in technology we now know we can test for multiple autoimmune diseases and we can detect them in the early stages before symptoms occur or before an official diagnosis. Autoimmune disease is on the rise, now affecting anywhere from 1 in 4 people….to 1 in 2! Why don’t we hear about it more than diabetes or cancer? Because we classify them into separate categories – Hashimoto’s Thyroiditis, Sjögren’s Syndrome, Rheumatoid Arthritis, MS, Celiac Disease, Type 1 Diabetes, etc. If you have one autoimmune disease (AID), you are statistically at risk for subsequent autoimmune diseases. Because it’s like you have a fire and if you don’t put it out, it just gets bigger and bigger. It goes from attacking your joints (Rheumatoid Arthritis) to your gut (Celiac Disease) to your brain (gluten ataxia) and on and on. I am writing about predicting autoimmune diseases because 25% of those with one autoimmune disease are likely to develop other autoimmune diseases. Dr. Gerald Mullin from Johns Hopkins says statistically somebody with an autoimmune disease is at risk of a total of 7 autoimmune diseases in his or her lifetime. If you have an autoimmune disease you may know that they commingle. If for example you have Celiac Disease you’re at risk for Type 1 Diabetes, Hashimoto’s Thyroiditis, Rheumatoid Arthritis, Juvenile Rheumatoid Arthritis, etc. That gives you the title of Multiple Autoimmune Symptoms (MAS). We now know that people are being diagnosed with autoimmune diseases at epidemic rates. 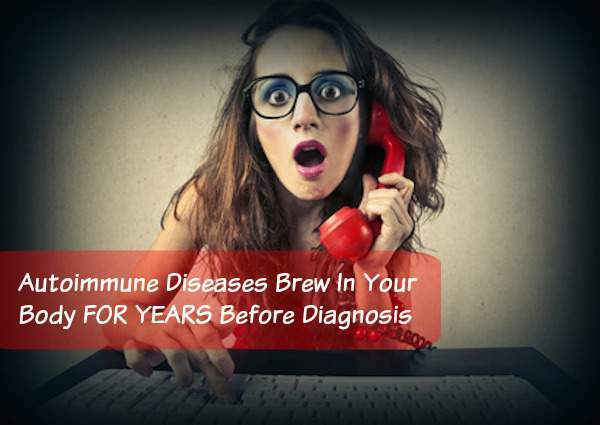 So this is an important topic because predicting or identifying autoimmune disease brewing years ahead of time can really give us a heads up. If you’re reading this article and you have one autoimmune disease, you need to pay attention because you could possibly be at risk for others. The process of an autoimmune disease is exactly the same. Our own immune system attacks our own tissue. We only differentiate it because it attacks different tissue. If our own immune system attacks the joints we call it Rheumatoid Arthritis. If our own immune system attacks our myelin sheaths or the coating of our nerves we call it Multiple Sclerosis. If our own immune system attacks the villi in the small intestine we call it Celiac Disease. We only differentiate autoimmune diseases by name but the process is the same. I think this has a lot to do with why if you have one autoimmune disease you are more likely to have more up to 7 on average. It’s because if you don’t put the fire out and it’s attacking your thyroid and you don’t do anything about that, you take your thyroid medication every day but you haven’t done anything to put out the autoimmune fire, it just continues on and attacks another tissue. We now know there are 80, and some say up to 100, distinct autoimmune diseases. If you’re wondering how you can possibly develop 7 autoimmune diseases it’s because we’re now classifying diseases like asthma, cardiovascular disease, small intestine bacterial overgrowth to have an autoimmune component. Old school thinking is Rheumatoid Arthritis is autoimmune and cardiovascular disease is not autoimmune and that’s just not true anymore. When somebody is sick they usually have a plethora of health conditions. Most people that are chronically sick don’t just have one thing they have a lot. There we go again tying in the fact that this process is affecting a lot of people and it’s effecting more and more tissue when nothing is being done to put the fire out. This is where my kind of training comes in because we do learn in functional medicine particularly how to put that fire out. It takes the “trilogy” to set you up for an autoimmune disease. Genes – Certain genes predispose our immune system to misreact. Having a gene does NOT equal a diagnosis. For example, I could have the gene for breast cancer, but with the right lifestyle choices I could save myself a diagnosis. On the contrary, I might not have the gene(s) for breast cancer but I choose to drink in excess, smoke, and not manage stress well and could end up with breast cancer. Just because you inherit a gene that doesn’t make you a dead ringer for a disease. Leaky Gut – Dr. Allessio Fasano has shown that it takes a leaky gut to propel or to move forward an autoimmune disease. The health of your gut has an enormous role in autoimmunity. A Trigger – This is an enormous list. Let me just list off a few and you can think about your own life. A trigger can be anything that moves the process forward. Possible triggers include gluten, dairy, stress, blood sugar issues, genetically modified foods, pesticides, herbicides, insecticides, heavy metals, chronic toxin exposure, viruses, infections, BPA in plastic, alcohol, prescription medications, and mold exposure. It takes the perfect storm. We now know we can identify autoantibodies YEARS before enough tissue damage and symptoms are evident. Melissa Arbuckle is a researcher and in 2003 she published her work in the New England Journal of Medicine. Here is what she discovered. She went back to the blood supply of veterans. They had saved the blood supply since 1978. She was able to find 132 veterans who had Lupus, which is an autoimmune disease, and she went back to the blood supply for each of the 132 people and discovered that 115 had antibodies to Lupus brewing for 9 years on average before official symptoms or before a diagnosis occurred. The big deal here is that they had antibodies for 9 years before they had enough symptoms and enough tissue damage to get diagnosed with Lupus. Dr. Schoenfeld a physician out of Israel has identified that the condition called primary biliary cirrhosis can have autoantibodies up to 40 years in advance. I want you to think of an autoimmune disease on a spectrum. It takes years before we have a diagnosis. You don’t go from 100% healthy on Monday to total Lupus on Tuesday. We now know antibodies brew for years. The point I’m trying to make here is that this is an opportunity to do prevention work. As an example, on the website for the American Diabetes Association, it says right on their website researchers found that most of those who later got Type 1 Diabetes had certain autoantibodies in their blood for years before. This isn’t a big secret. It’s right there on the ADA website. It’s just that conventional medicine doesn’t have anything to help you with until you get the diagnosis and now we can legally prescribe your medication. In the Functional Medicine training that I have we are very well adept at being able to intervene and either slow down the autoimmune disease process or halt it completely by removing the triggers. We can’t change your genes but we can certainly help with the triggers. Tracy Konoske is a Registered Dietitian who specializes in Natural, Integrative, and Functional Medicine. Tracy’s goal is to help you find the cause of what ails you. Clients come to Tracy from all over the U.S. since she specializes in a few areas and not all nutritionists are created equal. You can find Tracy on her website Healthy Lifestyles. READ NEXT: Autoimmune Patients, Have You Heard of Th1 and Th2 Dominance? Check out the ‘Coimbra Protocol’ for all autoimmune diseases. Theres a great book on amazon about it by Ana Claudia Domene Ortiz. The Coimbra Protocol has a 95% success rate (success is permanent remission) and has given thousands of patients a second chance at life over the last 12+ years. Forgot to add: combine the Coimbra Protocol treatment with the ‘Wahls Protocol’ diet! I have never felt right since I was 16 years old! (I’m now 57.) Back then I got Mono. It was so bad I left High School in October and never went back that year. During the worst, my Dad would have to carry me down the stairs to use the bathroom because I was too weak to walk. After that time, I was always exhausted, not tired- EXHAUSTED! Years went by, I saw doctors with same complaint and I always got blown off. 26 years later a DR took me seriously. He did a sleep study on me. He diagnosed me with a form of narcolepsy- daytime sleepiness! He prescribed Modafinil. It worked wonders, despite that it cost $200 a month. I had to keep increasing dosage. Years went on & I still didn’t feel right. I had classic symptoms of Thyroid, but my primary said for years my levels were fine, until I saw another DR for a different reason. SHE discovered Hashimoto’s. ( I had tested positive for ANA for YEARS, but doctors thought it could be from MONO.) She placed me on Synthroid. SHe has warned me that there is a chance that another autoimmune disease can always show up. I stumbled across this great website because I haven’t been feeling well lately and unsure what to do. IS it just my body aging with aches & pains??? I’m SO hungry lately….Gaining weight….HOT….exhausted, but wake up at night & can’t sleep….pain deep in legs, sometimes arms….can’t choose words…..hard to concentrate…..no ‘get up & go’ Then I think…I sound CRAZY! I can’t say this to the DR! Does this make sense to any of you?! Hi Maureen, I have a similar story. I developed Mono in my early 20s and I believe I’ve had hypothyroidism for years. It definitely worsened since then. Infections are a common trigger for thyroid issues including the thyroid autoimmune disease Hashimoto’s and Epstein-Barr Virus (mono) is a big one. Actually the more I read about Mono, the more I read that it can lay dormant in our bodies for years and flare up chronically for decades. Speak to your doctor about this. Good to have you at Hypothyroid Mom. I am looking for home remedies/ alternate/ holistic ideas to supplement with my synthroid. Any suggestions. I currently take a multi vitamin, vitamin d, probotics (seem 2 help with my belly issues) and an energy gummy vitamin. Hi Krissy, I put together a list of supplements that I have personally taken that has resulted in feeling so well with hypothyroidism. There is hope to be well even with a thyroid issue and that is why I created Hypothyroid Mom. You take all of those 19 supplements each DAY?! Hi Maureen, This is Dana Trentini from Hypothyroid Mom. It has taken me 9 years to be well and the list of supplements are the various things that I have personally taken over the years to fix the various health issues contributing to my hypothyroidism. It really is like a very big puzzle and our thyroid isn’t the only part. For example, the gut, inflammation, nutrient deficiencies, stress response, toxicity, and blood sugar issues are all common factors of hypothyroidism and that’s why there are different supplements to address each. I did them step by step. One of the first things that I did was address my gut using the probiotic, digestive enzymes, and betaine HCL. I no longer need the digestive enzymes and betaine HCL but I did that for many months and now I no longer get the indigestion, acid reflux and bloating. I then for many months addressed my liver with milk thistle and my inflammation with curcumin, and now I no longer use those regularly either. If you see what I mean. I addressed each part step by step. If there were a few things that I would recommend for everyone to try first it would be to take a high quality multivitamin, omega-3, probiotic, and adaptogenic herbs. Hope that helps. I see this now in my own body in hindsight. In my 20’s and 30′ I had endometriosis/adrenomyosis. I was treated for symptoms only until complete hysterectomy at age 36. Soon I had osteoprosis and osteopenia. In my 40’s I began suffering with what I now know is Autoimmune Hashimotos-not diagnosed until I was age 65. Then came LS. I am now on the AIP protocol and being treated for the Hashimotos’. I am hoping this is the end of the autoimmune conditions for me! After 36 years of research, I am absolutely convinced that the biggest “trigger,” if not cause, is vaccination. Lots of other poisons floating around out there, but this crap (biological waste products from , mostly, other species, containing foreign RNA, DNA, and animal viruses – combined with other nasty poison chemicals) is injected directly into our bodies. My sister and I have thyroid disease, as does a huge portion of the population these days. My brother died of ALS after getting a tetanus shot (most likely, a TDap). I have Hashimoto’s with autoimmune disease and taking Levothyroxine 25mcg. My TPO test came back at 900IU/mL and should be 9. I had this test in 2014 and was diagnosed with Hypothyroid but because the endocrinologist didn’t really pursue the issue and didn’t come up with ideas on why it is so high I abandoned doing anything about it. Stupidly. I started developing hives erratically for several years but not severely but in August 2017 they became more severe and I decided to go to an allergist which led to having another TPO which was still 900 and a thyroglobulin antibodies test. Also diagnosed with Chronic urticaria with slight allergy to beef and pork. I switched from Armour thyroid (pig) to Levo as a result which has no T3. I am very worried that I am now losing hair and that my T3 isn’t sufficient (low end of normal) I have been waiting 3 months to go to an endocrinologist in mid April. I am also questioning whether the autoimmune is connected to my thyroid. I would appreciate some help please to order all the questions I have. Hi, thank you for this article. I have hypothyroidism, I don’t know whether it’s hashimoto’s or not I just take levothyroxine. I’m wondering how I can know and whether I have other autoimmune diseases as well I’ve been getting very sick on and off this last year. Thank you! I have hypo and hashimoto’s. I believe you can be tested for the other autoimmune disorders. I hate my diagnosis, it triggers my anxiety and depression. Not a fun place to be. I take 125 mcg of synthroid daily. Levels have been stable for 6mths, I go back end of this month. Wish me luck.